Living cells are constantly sensing environmental changes, and their abilities to sense these changes and adapt to them are essential for their survival. In bacteria, histidine kinases are the major sensors for these environmental stresses, enabling cells to adapt to new growth conditions. Written by leading experts in the field, this book provides an up-to-date and comprehensive review on the structure and function of histidine kinases. It also provides extensive information on the physiological roles of histidine kinases in bacteria and eukaryotes. 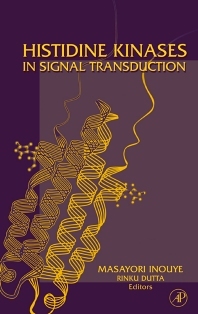 An an essential reference for cell biologists, microbiologists, molecular biologists, and biochemists interested in signal transduction. Experimental biologists and pharmacologists studying signal transduction systems in living organisms will also find it a valuable research tool. Is Flexibility between Domains Important for Signaling? Do Higher Plant Phys Function as Two-Component Histidine Kinases? Are Histidine Kinases Good Antibacterial Targets? Robert Johnson Medical School, Picataway, New Jersey, U.S.A.